When the green A icon is selected, select “File Email” to file the Email to Salesforce. When you file an email to a Salesforce record such as opportunity, the email and/or the attachment will be related to the contact and the opportunity via the activity history (for email) and attachments and notes section for attachments. For Outlook users, when the email is filed, a confirmation banner is displayed at the top of the email page. A blue category and mail icon appear with the conversation. 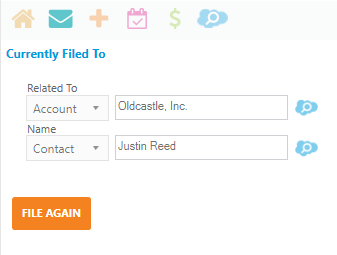 Filing Email in Salesforce has been made as easy as possible through the introduction of the Quickfile email icon. The ZynBit task panel shows contacts who exist in Salesforce with a green cloud, and beside that is the Quickfile lightning bolt. Clicking this icon will instantly file the email to the contact and corresponding account. The Quickfile icon beside the contact name will allow the use to file the email to that contact immediately. If there are any required fields for email records, a box will appear to allow this data to be completed. Otherwise, the email will be immediately filed. Processing of attachments will be determined by the preference set in the user settings file. Once the email is filed, the Quickfile icon changes to an envelope with a check to indicate the saved state. Once an email has been filed, you can click the File Email icon (the Green Envelope) on the top tool bar to show the location where the email was stored. You can then determine if the email needs to be stored in ad additional location, and use the File Again button to open a new email filing screen. Occasionally an email is received that needs to be filed in a location which is not associated with one of the contacts from the email. To file an email to an unrelated location, use the File Email icon at the top of the Zynbit panel. Click on the “Related To” button and choose the object you need. Then type all or part of the name of your record and click the search icon. Perform the same search for either a lead or contact in the Name area. Multifile is a new feature which enables filing of multiple emails with one set of clicks. First, select all emails desired from the mailbox (using shift or control as usual to get groups of messages) and then click the File Email option beside the desired contact. This image shows that all 3 messages were filed to the user Zynbit Internal who now has an envelope with the green check mark. Additionally, Quickfile can be combined with Multifile for high-speed bulk email handling. After selecting the messages, click the lightning bolt icon beside the desired contact record. All emails will be filed and the indicator markers (blue bar) will be set. File Latest Message and File All Messages and File Email Attachments. File Latest Message will file only the current message in the email conversation. File All Messages will file this and all previous messages in the email conversation.